In a nutshell: By diligently applying four simple rules, you can move from being at the mercy of money to being a master of money. In 2004, Jesse and Julie Mecham were twenty-year-old newlyweds trying to make ends meet. They lived in the 300-square-foot basement of a sixty-year-old home. He was pursuing a master's degree in accounting, while she was finishing a bachelor's degree in social work. Plus, they were planning for their fist child. The Mechams felt flat broke. But because Jesse was (and still is) a self-proclaimed “numbers nerd”, he decided to create a spreadsheet to budget for every day of the year. The couple steadfastly stuck to their budget, and something surprising happened. Despite their meager circumstances, they no longer felt desperate about money. They paid their bills and still had a little left over for a couple of date nights each month. Later, while brainstorming ways to earn extra money, Jesse wondered if other people would be interested in his budgeting method, which involved four simple rules. He started teaching others these rules and sharing his spreadsheet. In time, that spreadsheet morphed into a piece of software called You Need a Budget [my review]. In his recent book — also called You Need a Budget, naturally — Mecham shares the method that has helped him (and thousands of others) overcome financial anxiety. Let's take a quick look at the YNAB method. Note: Throughout this review, I've embedded videos from the YNAB YouTube channel. While these videos contain great supporting material, they use slightly different terminology from the book. Not a big deal, but I thought you should know. Before you can give every dollar a job, though, you have to know which “jobs” need doing. Begin be listing all of the places your money needs to go — your obligations, the expenses that cannot be ignored. For most folks, these top priorities will include housing, utilities, transportation, and health care — survival stuff. Again, you're trying to answer the fundamental question: “What do I want my money to do for me?” First, you want it to cover survival basics. Next, you want it to help you enjoy life. What about irregular expenses? That's where You Need a Budget‘s second principle comes in. After you budget for essentials but before you budget for the fun stuff, Mecham advocates setting aside money for what he calls “true expenses”. Predictable expenses include things like your auto insurance or home insurance, which might be paid once or twice each year. They also include stuff like electricity bills (which might spike in summer and/or winter) or holiday gifts and trips. Unpredictable but inevitable expenses are those curveballs life throws you: The transmission fails on your car, your 12-year-old dog needs surgery, you discover dry rot in the attic. It's these true expenses, Mecham says, that derail most budgets. The average person is great about setting money aside for necessities and, especially, for the things they value in life. They're not so good at remembering to account for periodic insurance payments. And they're terrible at planning for the unpredictable but inevitable obstacles. With his second rule, Mecham is trying to get reader to think long but act now. This can be tough for some folks. This sort of budgeting and saving feels like sacrifice. It's not. You're absolutely getting something you want — but it's something you want or need in the future, not today. “Every time you choose to put money toward a long-term priority,” he writes, “you're literally spending money ahead to the future, setting Future You up for success.” Amen! The third rule of You Need a Budget is all about making adjustments based on whatever comes your way. Because your budget is a plan that reflects your life and priorities, your budget should change as you life and plans change. Rule Three is also about being completely honest with yourself about what's truly important. Mecham conveys this concept with a story from his own life. For a decade, he and his wife overspent their budget grocery nearly every month. They kept setting optimistic targets, then missing wide. Eventually, his wife got frustrated. “I do not care what a can of corn costs,” she told him, and something clicked. They bumped their grocery budget to something more realistic. The bottom line? Changing your budget is not failing. Neither is missing your targets. Don't let it get you down. Roll with the punches. That's budgeting in real life. The first three rules of the You Need a Budget method create a framework that allows you take charge of your money, to control it instead of letting it control you. If you follow these rules, you'll find that you gradually move from feeling pinched every month, to having enough, to eventually generating a surplus of cash. Rule four is about building a stockpile of cash so you have enough saved to cover your expenses for a very, very long time. Money's “age” is based on the gap of time between when you earned the money (money in) and when you spend the money (money out). If the money you're spending on Tuesday was deposited on Monday, your money is one day old. If it's Friday before you're spending that money you deposited on Monday, then you money is four days old. Mecham says that living off “old” money can feel like a pipe dream if you're living paycheck to paycheck. It can seem like a luxury reserved for the super-rich. From his experience, that's just not true. As you apply his rules, he says, you'll move from having a stack of bills waiting for money to having a stack of money waiting for bills. The book includes chapters on budgeting as a couple, slaying debt, teaching kids to budget, and what to do when you feel like quitting. 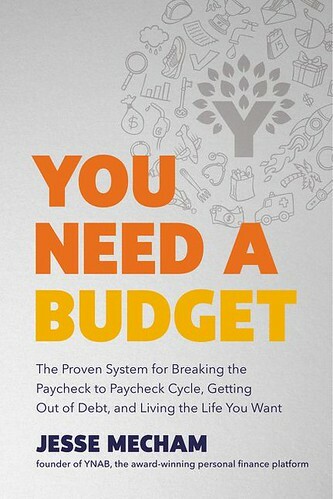 It's also peppered with examples and real-world stories (some of Mecham's own family) to illustrate the You Need a Budget philosophy. Because Mecham has been reading and writing about budgets since 2004, he's learned a lot about what works and what doesn't. He's constantly receiving feedback from the tens of thousands of people who follow his program. This book is a culmination of that experience, and it shows. If you need a budget, I highly recommend this book. There are 4 reader responses to "Book Review: You Need a Budget". Being a minimalist, I’ve never bothered with a budget. Instead, I live in an “artificial environment of scarcity.” In other words, even though I’m quite well off, I kinda live my life as if I were poor. The money really piles up this way. But it’s actually *fun* for me living like this — eating a third-world diet, hardly having any clothes or possessions, and vacationing a lot in my own state, etc. It’s kind of like a fun game for me to see how extreme I can take things. Anyway, for people who don’t want to mess with a budget, just pretend you’re poor and act accordingly! I like that approach dh. I probably don’t take it as far as you do, but I also live well within my means. I spent about half of what I can afford on a house, less than half on cars, and this leaves me plenty of money to save, invest, and enjoy life without worrying about money. My wife and I also have our occasional arguments, but they are never about money! Yeah, za, getting a divorce is what really allowed me to simplify in such a hard-core way. As the great minimalist guru Elaine St. James once said, “No other thing you could possibly do will simplify your life as quickly or completely as getting out of a relationship that isn’t working.” Amen, sister! I have always been a big fan of assigning each dollar you earn a job. For much of 2017, my income had 3 specific jobs. They were either be used to build an emergency fund, pay off my debt, and then invest. Looking towards 2018, my income will have specific jobs that include maxing out my families retirement accounts, and then saving for our starter home. This is a great post and thanks for sharing!